Wbox is free software under the BSD license and was written in ANSI C (POSIX runtime required) by Salvatore 'antirez' Sanfilippo( click in this link to know more about Salvatore). WBox aims to help you having fun while testing HTTP related stuff. You  can use it to perform many tasks. In backtrack 4r2 . its already installed . Now lets see how to open wbox on backtrack 4r2 and backtrack 5r3 . To open WBox in backtrack 5r3 , just open konsole and type the command wbox . After command execution your wbox will be open as shown in thw below image . The below image shows all the options . 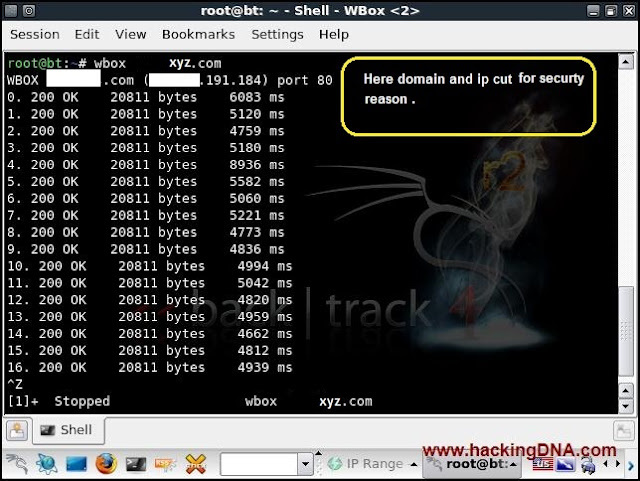 EXAMPLE : Now I am going perform the  examples with both Backtrack 4r2 and Backtrack 5r3 . This is the simple example . 200 OK : is the HTTP request and the reason string . 20811 bytes : is the number of the bytes that is recieved from the server . 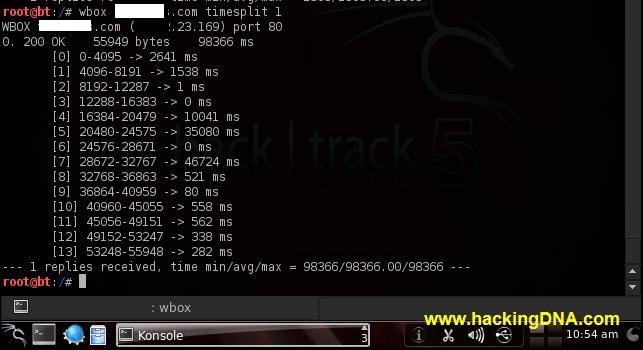 Example is same difference is this time we use backtrack 5 with different target . In this example we use the option showhdr , which is used to dump the http header . If the page is moved permanently , then it show as shown in the below image . We run this example on Backtrack 5 . If you want to limit the number of request then you have to use this option . Timesplit is used to obtain time information for different parts of the data. If you want to see header + body of the website then you can use this option . If you use silent option , it won't show you the status lines . Instead of single request , here we send multiple requests using the clients number options . Command Syntax : wbox < url > clients 3 . Here every client prints a status line and you can  a idea of delays underload . If the web server supports the compression ,then it will reply with the compression  data ..
And wbox will show in the reply status lines . THIS IS HOW WE CAN USE WBOX IN BOTH BACKTACK 4R2 AND BACKTRACK 5R 3 . FIRST TIME I HAVE USED  BT4 AND BT 5 TO COMPLETE THIS TUTORIAL . YOU ALSO TRY WBOX AND DON'T FORGET TO JOIN US ON FACEBOOK .